With different team settings, you can play in teams, or you can play individually in an all-out, free-for-all style laser tag battle. At a very affordable price, this set of either 2 or 4 guns is a great entry-level laser tag set for both kids and adults. What’s awesome about these laser tag guns is that they are very simple, yet reasonably sophisticated machines. The different features on the guns are all very functional without going over the top. The guns are also lightweight with comfortable handles that will fit hands of all sizes. Let’s go through the main features of these very cool laser tag guns. The guns can be turned on by pushing the power trigger switch up. This switch is located at the side of the gun, and admittedly, it feels a bit clumsy. A simple push button to turn on the machine would have probably made a bit more sense. Not a big deal by any means though. Once the laser tag gun is switched on, the circle in the middle of the gun lights up and the gun will start making a bit of noise. Your laser tag gun is now active and you’re ready to decide on team and blaster settings before starting your next battle. The team settings button is the smaller button that can be found on the left side of the gun above the trigger. Simply keep pressing the button until you find the desired team setting. You can play in teams of multiple players (with different colors), or you can decide to play individually against each other. Once the right team setting is chosen, simply pull the trigger to start shooting and the battle can begin. Please note that the Call of Life laser tag guns are interchangeable. This is great, because if you buy multiple sets (either 2 or 4), all guns will be able to work together nicely. The other button on the side of the gun allows you to configure your blaster settings. 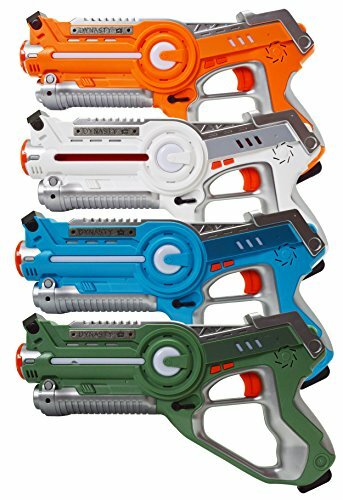 Each of these blasters have their own ammunition levels and amounts of shots you can fire at once. Also, the damage you can do to your opponent (stealing lives) is different for each setting. The heavier your gun style, the more damage you can do, but the less ammunition you have. This is simply awesome, because it makes the game a bit more strategic. You can change the setting during play as many times as you like, as long as you reload after each change. Each player has 9 lives at the start of each battle. Three indicator life lights at the top side of the gun tell you how you are tracking with your lives. Each light represents 3 lives and as soon as you’ve been hit 3 times, you will lose one of the lights. The lights will start to flicker at different speeds, which tells you in what shape you’re in during battle. These guns typically have a max range of 50-60 feet, depending on where you are and which blaster setting you choose. A reasonable range, more than enough for battles at home or in the park, but obviously not as good as with professional laser tag guns in arenas. >> Check out our list of best laser tag guns currently available. With the Call of Life guns there is no need to wear a target vest, like you would have to in a professional laser tag arena. The target sensor or infrared receiver is located at the front of the gun and is able to register hits really well. You will hear a sound each time you’re hit. The ammunition indicator is located at the top of the gun and tells you when you need to reload. Reloading is easy, simply hit the button at the base of the gun with the palm of your hand, and you’re good to go. Each time you change the blaster setting you will also need to reload. Watch this entertaining video of a dad and his kids reviewing the Call of Life laser tag guns. It’s a long video but well worth it. The Call of Life Laser Tag set by Simply Addictive Games (now sold by Dynasty Toys) is an excellent laser tag set for young and old. What we like most about these guns is that they offer more than enough sophisticated features, yet they are very easy and intuitive to use. Perfect for kids! The guns are lightweight and the very comfortable handle will fit adult hands too. The design and the bright colors give these guns quite a professional look-and-feel, although from close-by they can feel a bit plastic-ish. But hey, these are toys after all. The sensor can register hits really well and the sound and light effects are spot on. The different blaster styles and ammunition and damage levels add a bit of strategy to a laser tag battle, rather than just randomly shooting each other. Hi Kathy, best to turn the guns on and off and re-do the settings the way you prefer for a new game. My gun only has the red lights blinking on when turned on. What does this mean, am I able to reset the whole thing? No buttons work and it makes the loading noise when turned on. Are these guns appropriate for an 8-year old birthday party? There would be a group of 10 kids all about 8 years old. Hi Alexia, yes absolutely, kids love these laser tag guns. The colors, the sounds, and they’re also very easy to use. It may be good though to have one adult play along or to act as some sort of referee just to make sure the battle runs smoothly. If you haven’t already, I’d recommend you watch the video in this article to see how much fun those kids are having. I got 10 of these.. you say they can be used individually.. how do I set this up.. I have a game in mind where everyone should be able to shoot everyone els. 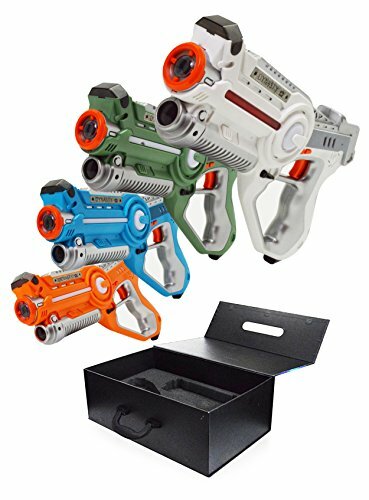 Hi Daniel, there are 4 different colors available so with a set of 4 guns you can play with 4 individuals against eachother. But if you have 10 of these laser tag guns then you’re going to have to form small teams. You can still play with 10 individuals but players with the same color can’t shoot eachother. Is the multiplayer laser tag set of 4 currently sold by Legacy a new or used product? Hi Louise, thanks for your comment. Good question, it seems this laser tag set has recently been re-branded from Simply Addictive Games to Legacy Toys. We got ours a long time ago and love it, and we have no reason to believe that they are now sold as used. Especially looking at the latest reviews, it seems they are still sold as brand new. I’d like to agree with basically all points in this review. I don’t often take the time to write comments, but I know a lot of parents will read this and I want to help them pick the right laser tag system. I would highly recommend the Legacy Toys Call of Life system (a somewhat eclectic title for laser tag guns, IMHO) for most people. The system is as a HUGE hit with my nine year old and his “posse”, ages seven to ten. I picked up six guns as it was cheaper to buy three sets of two guns on Amazon. I also picked up two of the single gun sets that come with a Nano bug target. I actually played with the guns by myself several times before the birthday party they were intended for just to try them out. I don’t agree with the age recommendation of 8-10 years and up. A reasonably intelligent kindergarten age child should have no problem operating the guns, with some instruction and a gentle and short learning curve. I do have a few minor quibbles. Briefly, no sights, battery compartment screws get easily lost and the range was shorter than the advertised 125 feet. After some testing I found 75 feet to be the maximum range I could score a hit. I tried all four weapon settings and found the “pistol” to be the most accurate at extreme range. This shorter range limits outdoor play-ability, although we’ve had many epic indoor battles! None of these quibbles should prevent Call of Life laser tag from being the perfect laser tag system for the majority of people. I actually found these guns to be cheaper on Amazon than on eBay, which I don’t usually find to be the case. I strongly recommend picking up a pair of two gun sets, rather than the four gun sets. And if you want different colored blasters, bust out the masking tape, sharpies and spray paint. We’ve had fun customizing our blasters, just make sure to carefully mask the barrel lenses and cooling holes if you use spray paint. We own Call of Life and WowWee laser tag systems and have tried out some of the Nerf laser tag guns. I rank the Call of Life system as the best all-around product at an affordable price. When you’re dead, what do you have to do to join the game again? My son just got the nano target set with the bug for Christmas. It worked as expected initially–he shot the bug, it flipped and froze, then began scampering again until he shot it again. Now, when he shoots it, it flips over but doesn’t start moving again. Any ideas on a solution? Thank you. Hi Jeff, we have never had a play with the nano target version, but by the sounds of it, it looks like you have a faulty product. We would recommend to contact the supplier, explain the situation (perhaps film what happens) and see if you can get a replacement. Hope it works out for you.